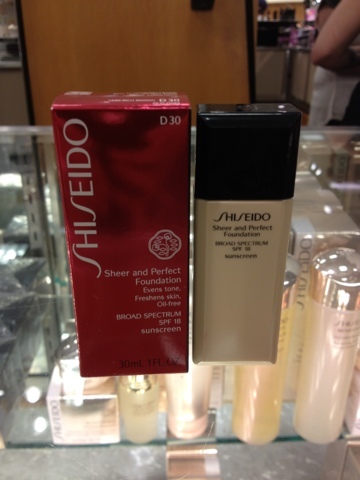 Following up from the Shiseido launch of their new Sheer & Perfect foundation last week, I was given a small goody bag. In this goody bag was a Shiseido White Lucent Mask. Being a bit of mask enthusiast, of course this had to be the first thing I tried out! The White Lucent Mask comes individually packaged in a box of 6 which will usually go for a price of $68. It is a steep price for only 6 uses, but I found it incredibly effective in just one use. They work by saturating the skin with a rather large amount of brightening ingredients at once, in this case 4MSK (Methoxy Salicylic Acid Potassium Salt), a scientific look at this ingredient in this product's use can be found here. This is an individual package, within this package is a literal mask for the face made of some cotton, elastic-y material absolutely saturated in the 4MSK ingredient. It has holes for the eyes, nose and mouth cut out it in, and I look like a bubblehead nurse from Silent Hill while wearing it. Even if the comparison isn't exact, it's pretty spot on. However, for 10 minutes of being a creepy crawly, I'd still say it's well worth the wait. BEHOLD, before and after shots! I'd say for one application that that's not too horrible. Brighten dark spots and even out the complexion. YES, I noticed several of my acne scars diminish noticeably in the 12 hour period. It tackled the darker areas without bleaching my face. I did not experience any breakouts or sensitivity, in fact, it was quite gentle. Other than the appearance while using the product, I very much enjoyed using it. It was comfortable, stayed on nicely, the remaining product when the mask was removed absorbed quickly and proved very effective in accomplishing it's function. When I begin to get age spots, I will be turning to the White Lucent Mask first! A gentle anti-inflammatory derived from coconut oil and commonly used in soaps. Apple products can be just as vulnerable as any other systems to attacks, especially social engineering attacks. This article details a method that uses a compromised iPhone charger to hack into the phone and allow the person that it phones home to to collect valuable data. If there is one skin care brand that I absolutely cannot live without, it is Shiseido. So, when my friendly neighborhood Nordstrom Shiseido rep gets in touch with me that there will be a makeover event with goodies involved, of course I'm in! The event was based around Shiseido's new foundation line launch titled "Sheer & Perfect Foundation" which is a very sheer (as clearly stated), lightweight foundation which centers around color correction. It works by using its foundation tint, white powder, blue powder, and green powder for correcting most problem shades. It comes in a clear rectangular of 1oz, and is removed from the container via a tiny brush. When being buffed in the foundation feels much like their other lightweight products, like water. Colored water, watercolor paints? Seriously, how does it still feel like water after having such a wide ecosystem of powders in there? It did certainly color correct! It also has fantastic staying power over the next 7 hours in which I wore it, passed the sunglasses test (in which a very negligible amount rubbed off on my sunglasses in sweaty weather), and did not seem to break me out, in fact, I looked a little better in the blackhead department the next day (although that could have been the work of a Clarisonic that the awesome rep used on me). My only issue with the foundation is that it is rather difficult to remove, I used my oil cleanser as an initial remover, it felt as though I had gotten it all off. When I used my toner on a cotton, I saw even more color come off. And the next morning, using a foaming cleanser, I managed to finally get the last bit of color off. At least the staying power is fantastic if you have a very long day! I like it, while the longevity and coverage are positives, it's a little too long lived for me to want to buy. Well, there was brainwashing, and now we are beginning to implant false memories. It's only a few years until this is truly a reality, which is both a fascinating and scary thought.